I found this thicket of wild Chickasaw plums in south Richmond County, Georgia. The thicket covers at least 2 acres. Wild plum thickets abound over much of North America. They’re a pioneer species, growing extensively in old overgrown fields before other trees eventually shade and thereby outcompete them. The lifespan of a plum tree seldom exceeds 20 years anyway, which is the length of time a plum thicket lasts during its stage of forest succession. Plum thickets are a common site along roadsides in Georgia and other southeastern states. For various reasons highway crews often clear corridors on the sides of roadways, and plums thrive in the sunny locations when overstory trees ares stripped or removed. Today, birds and small mammals such as oppossums, raccoons, and gray foxes eat the fruit and spread the seeds in their feces. American Indians also extensively planted plums around their settlements. 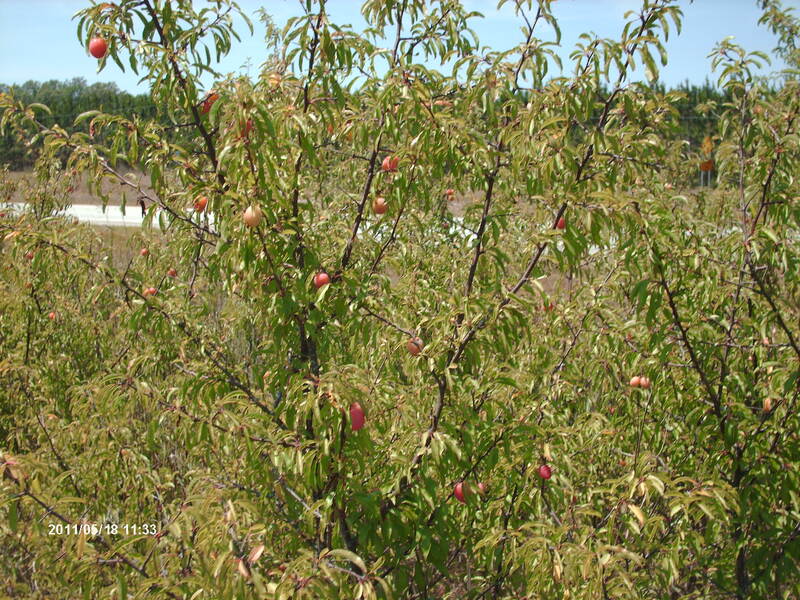 The variety of plum in the above photograph is known as the Chickasaw plum (Prunus angustifolia), and it is believed to have been originally cultivated by the Chickasaw Indians. They spread the variety east from their early settlements. 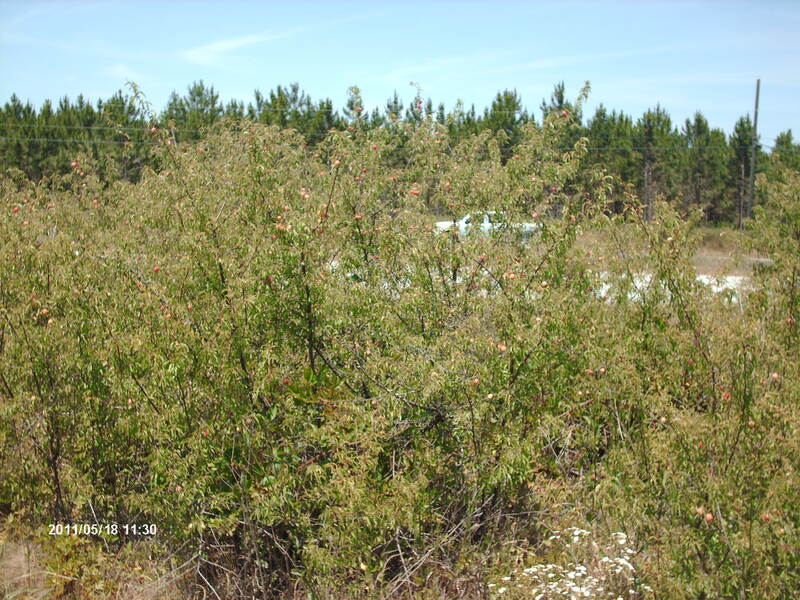 There are 3 species of wild plums that range into Georgia, including south Richmond County where I found the plum thicket pictured above. I used photographs from google images to compare and distinguish between the 3 and determined that the ones I found were probably Chickasaw plums, though I’m not a trained botanist, so I don’t know for sure. The other 2 species are the American plum (Prunus americana) and the hog plum (Prunus umbellata). I harvested a pint of the Chickasaw plums (I could’ve collected bushels.) They are as sweet and tasty as the best quality cultivated plums one can buy at a supermarket. The only drawback is the small size–they’re a little smaller than cultivated cherries and the fruit to pit ratio is even smaller. Picture of mastodons from google images. Photo of Mastodon dung recovered from the Aucilla River. The dynamic landscape of the Pleistocene included natural environments in all stages of forest succession. Disturbances and atmospheric conditions such as fires, storms, megafauna foraging, insect damage, disease, floods, beaver activities, drought, and low CO2 levels contributed to frequent formation of meadows, prairies, and savannahs–all suitable environments for plum thickets. With mastodons (and giant ground sloths) facilitating their spread, plum thickets must have been just as common then as now, if not more so. This is an addendum to my last week’s rant about the environmental destruction that white slave-owners inflicted upon Georgia in the early 19th century. My favorite poem is the lyrics to the rock group, Rush’s song “The Trees.” Rush is a fantastic group, if you can get past the high voice of the lead singer. It’s amazing that just 3 people can put out the amount of sound they do. Anyway, here are the lyrics. Last week, my quest to find the site of the 18th century Great Buffalo Lick took me on a journey along Highway 22. Few people who travel Georgia’s state highways realize that many of these roads through the piedmont region closely follow the routes of old Indian trails. And Indians were simply following ancient megafauna game trails. Historical map of known Indian trails. I think Highway 22 originally was a branch of the Pickens Trail. According to the treaty signed with the Creek Indians in 1773, an Indian trail that closely mirrors modern day Highway 22 formed the western boundary of what was to become Wilkes County. Recall that last week, I chased a turkey hen with my car up the gravel road that led to Kettle Creek Battlefield. The turkey chose the path of least resistance and seemed reluctant to leave the road for the cover of the brush because it takes more energy to run though thick vegetation. Animals don’t like to waste energy. They need to retain as much body fat as they can so they can survive hard times when there is less food or when they can’t forage due to injury. Therefore, animals tend to travel along paths already trodden down by other animals or created by man. While driving on a state highway, it’s exciting to contemplate that I’m probably following a path of considerable antiquity. The routes could be tens of thousands of years old. Originally, a herd of mammoths or mastodons formed the trail, beating down the grass and brush, stomping flat the saplings, ripping off overhanging tree branches. Herds of bison, horses, llamas, deer, and peccary used the trail, keeping the path an open avenue. Photo of a game trail in Africa formed by elephants and followed by other animals. Even though this part of Africa is open grasslands, animals prefer to travel along the same routes to avoid resistance from plants and terrain. 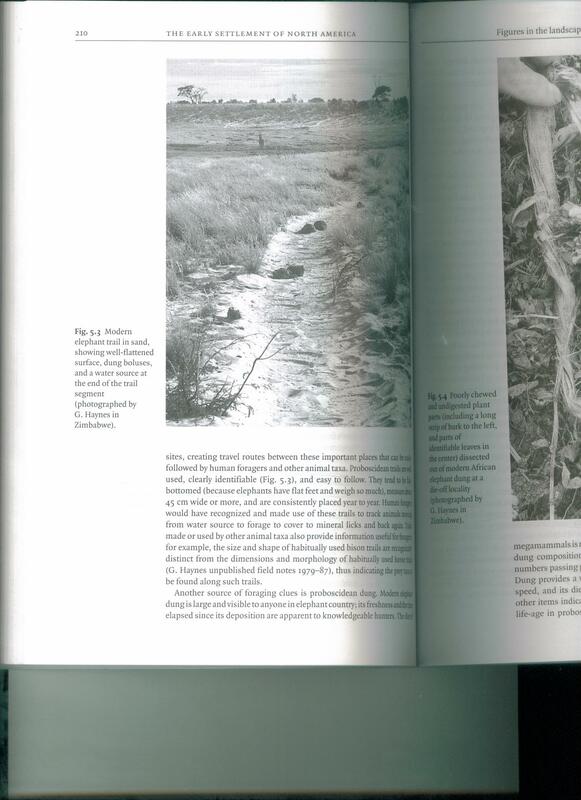 Photo from the book The Early Settlement of North America: The Clovis era by Gary Haynes. 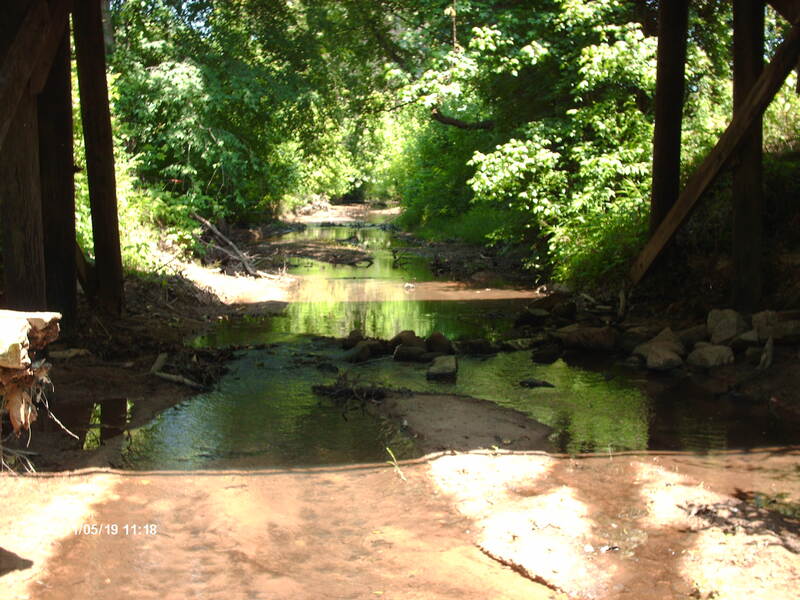 The paleoIndians followed these game trails too which were more prevalent in the piedmont region for two reasons: Unlike in the coastal plain, rivers in the piedmont were rapid with lots of rocky shoals, precluding the ease of travel by boat. And the piedmont was more forested, necessating a preference for clearly marked trails both for ease of travel and to keep from getting lost. Indian trails in the piedmont followed high ridges and avoided frequent crossings of deep creeks or wide rivers. When they did lead to river crossings, they converged at shallow rocky areas that were easy to ford. A number of Indian trails converged at what’s now Augusta because there are rocky shoals here that make fording the river easy. I’ve crossed them myself many years ago. If it wasn’t for these shoals, Augusta would not exist. Fort Moore was the predecessor to Augusta. 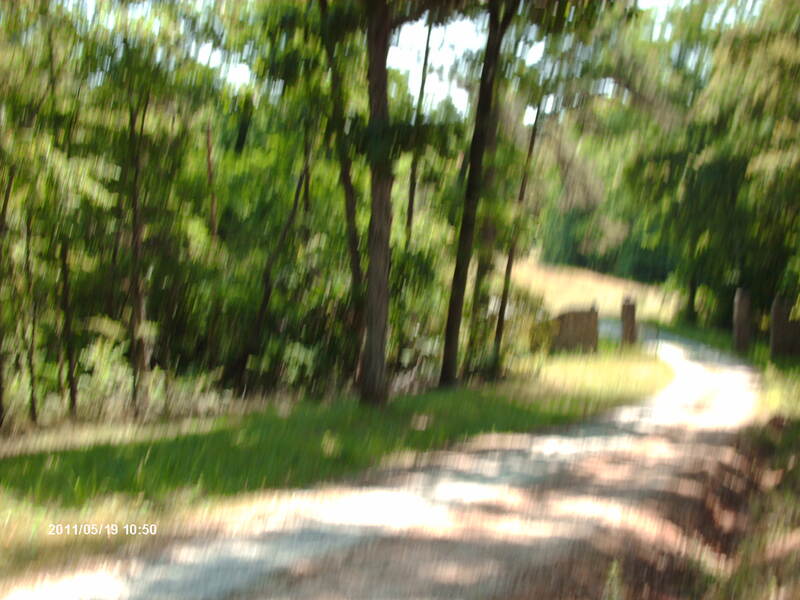 General Oglethorpe chose this site for a trading fort because many Indian trails converged here. Because open pine savannahs and wide navigable rivers prevailed in the coastal plain, Indian trails were less common or necessary there. State roads built after World War II no longer needed to follow these old trails because heavy machinery made it possible to flatten hills, grade uneven land, and construct large bridges. Warning: I’m getting on my soap box about the complete destruction of Bartram’s magnificent forest. I am bitter. I wrote about an impressive old growth forest described by William Bartram in my April 11th blog entry. On my expedition to find the Great Buffalo Lick, I also searched for remnants of this forest and found absolutely none. ( I assumed the state highway followed the old Indian trail.) 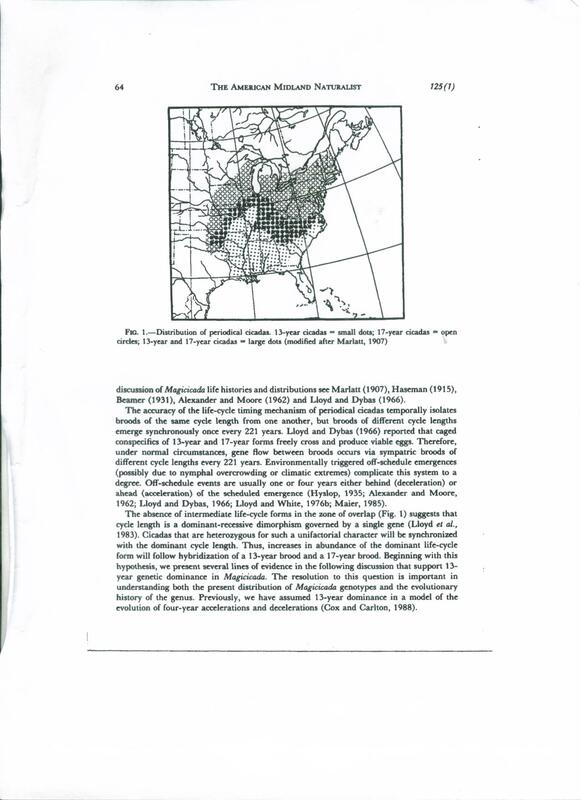 As I suspected, the entire forest, many square miles of “gigantic” black oaks, sycamore, sweetgum, and hickory must have been cleared by cotton farmers between 1790-1860. Today, the area from Little River to Philomath consists almost entirely of dense stands of loblolly pine and sweetgum–a monotonous nearly dead ecosystem. I saw only a few black oaks–none of them “gigantic.” Instead of a “thinly planted by nature” oak parkland, it’s practically a monocultured thickly planted tree farm. I saw not a single tree more than a foot in diameter, whereas William Bartram traveled through 7 miles of trees that were 8-11 feet in diameter. I estimated, based on the appearance of this loblolly pine and sweetgum second growth, that the area was one big cottonfield until about the 1930’s, perhaps reverting to field following the boll weevil infestation that broke the back of agriculture here. I can’t believe the greedy bastards who first cleared this land for growing cotton couldn’t protect even a small park of this original forest. We will never see how beautiful the original environment was in this area. It was destroyed before photography was invented, and no 18th century artist chose to paint it. Instead, these stupid, illiterate bullies used slave labor to cut every single tree down, remove every stump, burn every bit of lumber refuse, and they continued to plant cotton seed in the bare red earth until the once rich soil and landscape transmogrified into a worn out old hag of its former self. The natural beauty of the original environment has gone with the wind. This is one more disgraceful legacy of southern white people. In addition to crimes against humanity (slavery and an insurrection that led to the deaths of millions) I charge them with crimes against the environment with their destruction of Bartram’s magnificent forest. Neither did I see remnants of the Indian mounds Bartam mentions, so go ahead and consider white southerners guilty of crimes against archaeology as well. I condemn white southerners for their disgraceful history, and for their current political stances which are still overwhelmingly backward, racist, ignorant, and short-sighted. In Febuary 1779 Colonel Boyd of the British Loyalists sent 150 men to forage the nearby farms for supplies such as cattle which they likely stole. While the foragers were busy slaughtering their booty, Boyd hunkered down with the rest of his men on a hilltop near Kettle Creek which is actually more of a small river about 30 feet in width that runs through what today is Wilkes County, Georgia. Colonel Dooly of the Patriots decided this was a good time to attack because he only had 340 men compared to the 550 remaining Loyalists who were missing the foragers. 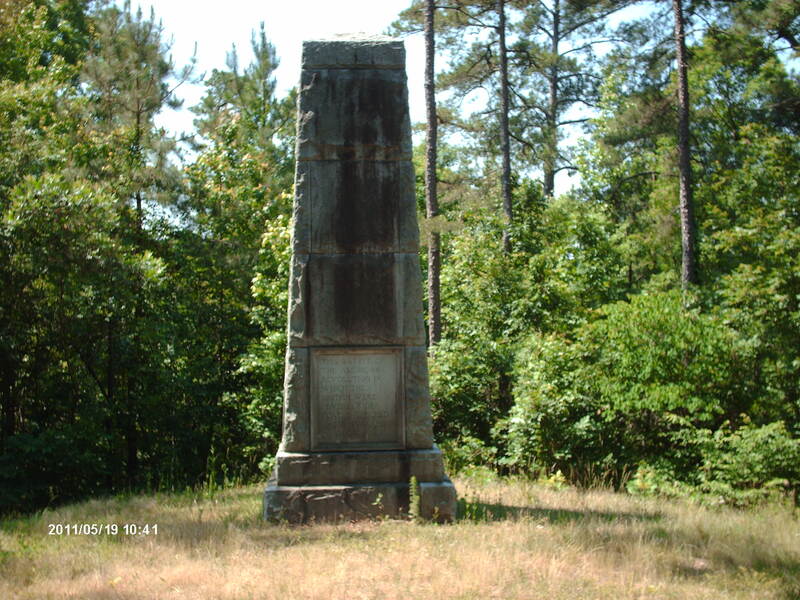 Andrew Pickens led a frontal attack up the hill, while flankers led by Dooly and Elijah Clark headed through the woods. Unfortunately for the Patriots, Boyd’s skirmishers and sentries successfully ambushed Pickens, and the swollen creeks and canebrakes slowed down the flanking attacks, making them well behind schedule. The Patriots attacked up this hill. The Loyalist who took this photo was kind of nervous–note the blurry image. Actually, I took all the photos in this week’s blog entry. The Loyalists were winning, but the battle turned when a Patriot musket ball struck Boyd in the heart, killing him, and just at that moment the Patriot flanking attacks emerged from the canebrakes. Now surrounded on three sides, the Loyalists retreated in panic toward their only escape route–the cold swollen waters of Kettle Creek. Some made it across, but up to 70 were killed and 70 more captured. The Patriots suffered just 9 dead. Some of the Loyalists who escaped were later captured and hanged because they’d previously pledged their loyalty to the Patriots. This seems harsh by today’s standards, but back then, going back on one’s word and disgracing one’s honor was considered a crime equal to murder. The battle demonstrated the futility of British efforts to subdue its American colony. The foraging thievery of the Loyalist militia turned the countryside against them as well. Graveyard for veterans of this battle. Most buried here didn’t actually die on the battlefield. 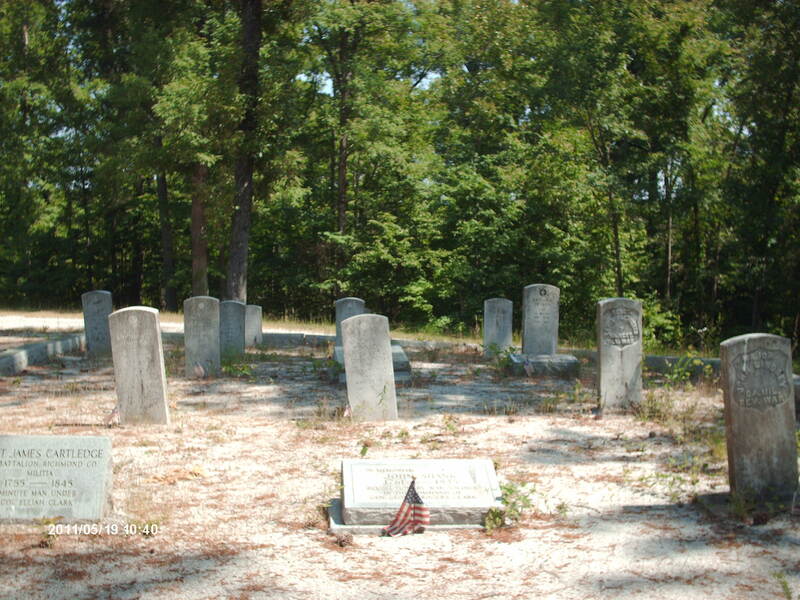 Some didn’t die until 65 years later and chose to be buried here. They must have talked about this battle for the rest of their lives. 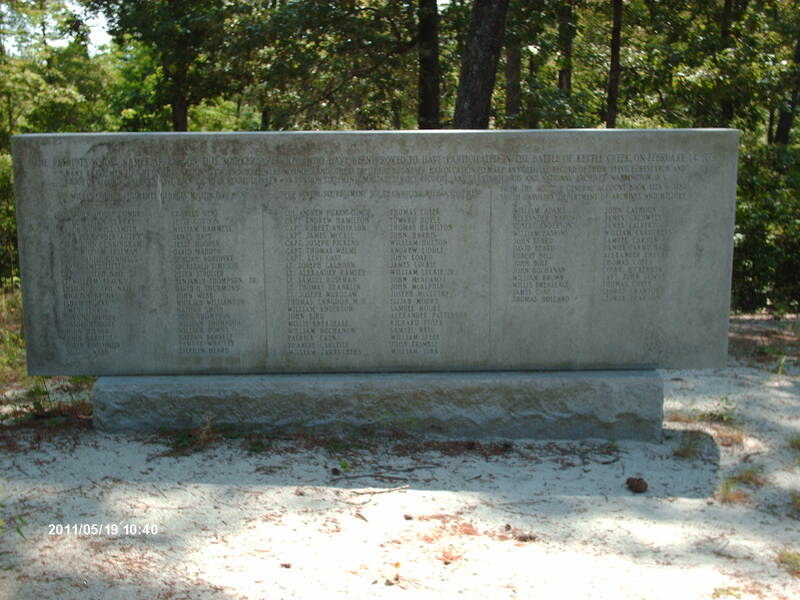 List of soldiers proved to have fought in this battle. Behind the battlefield, a nice hardwood forest slopes toward Kettle Creek. The canebrakes are gone. 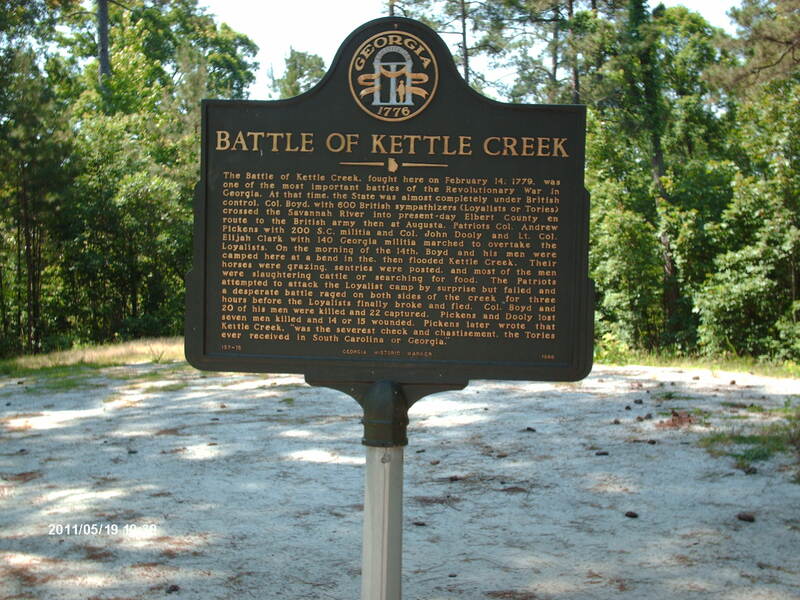 Today, the Kettle Creek Battlefield sits at the end of a long gravel road that cuts through miles of young loblolly pine stands and old fields where turkey and deer are abundant. I chased a turkey with my car for awhile, and the turkey chose to try to outrun me for about 100 yards up the road before it flew a little, landed, and finally cut into the brush. It’s a small battlefield within a woodlot of black oak, post oak, shortleaf pine, and shellbark hickory. The canebrake is gone, probably due to fire suppression. Little Kettle Creek is a much smaller stream than Kettle Creek, but it flows through a surprisingly deep gulley–evidence that it’s a very old watercourse that at times has run much deeper. Note how deep this gully is compared to the size of the stream. Both banks must be at least 30 feet deep. It must be very old and in the past has run much deeper. It’s obvious the creek is old because it has eroded a miniature canyon here. This is the only Pleistocene fossil site in the entire piedmont region of southeastern North America, yielding remains of mammoth, mastodon, bison, deer, voles, lemmings, and catfish. Fossil sites are rare in this region for 2 reasons: a lower frequency of floods during arid glacial climate phases, and acidic soils which completely dissolve bone. Nevertheless, there must have been a flood that washed fossils into this basin. I briefly prospected for fossils under the bridge in a likely location behind a rocky dike where lots of smaller rocks and stones accumulated, but I came up empty. The actual fossil site is a few hundred yards downstream from here, however, I chose not to trespass–the barbed wire across the creek hinted at hostility toward interlopers and a determination to keep cattle inside. I supposed the area under the bridge was a public right of way, though maybe I was on shaky ground, and I didn’t stay long. Still, I’m convinced there are more fossils to be had here and in other piedmont rivers and creeks in Georgia. It’s just a matter of taking the time to look. They’re just harder to find than they are in productive sites like those in Florida. A look up Little Kettle Creek. I just missed catching a deer fawn in this photo. The mammoths, mastodons, and bison may be gone, but at least the deer are still here. I did see lots of wildlife here, despite the noise of a nearby hay mowing machine. A finger of forest along the creekside snakes through hayfields. I saw a deer, a deer fawn, and lots of deer tracks. 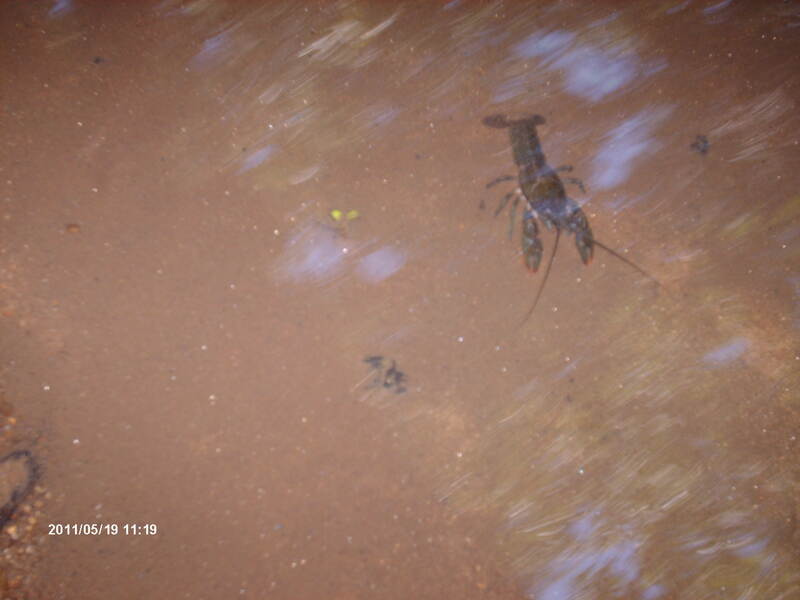 A crayfish observed me swing my hand through sand and rocks in my futile search for fossils. 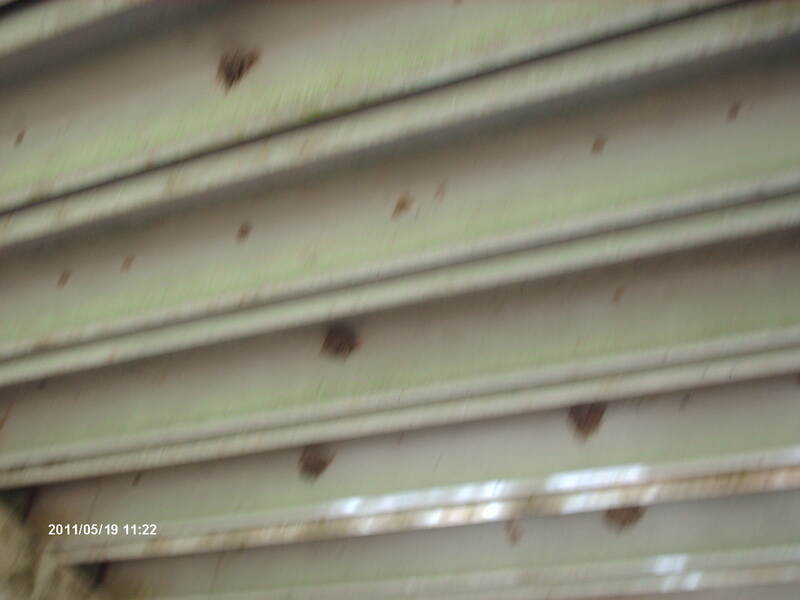 Swallow nests litter the bottom of the bridge. A broad-winged hawk flew in front of me, and I almost stepped on a mourning dove. This crayfish watched my futile attempt to find fossils. I didn’t find fossils in front of these rocks, but I did find neat stones that were half black and half marble white. Swallows make mud nests under all small bridges in the Georgia countryside. I love the speed at which they fly. They consume vast quantities of flies and mosquitoes. Wilkes County is still a beautiful bucolic setting, especially the area along Highway 44 between Washington and Tyrone. It consists of rolling hillsides with rich pastureland and hayfields interspersed with oak woodlots. 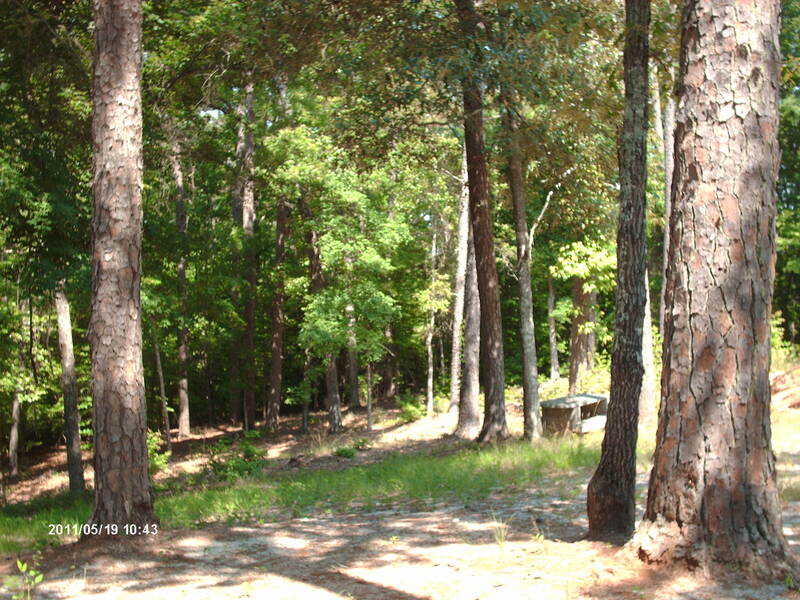 There’s less of the monocultured loblolly pine tree stands that dominate much of the rest of the region. It has a population of only 10,000 people. They might be outnumbered by deer and turkey. In 1773 the Creek Indians, after seeing how the British colonists murdered the Cherokees in battle, agreed to meet local British leaders at the Great Buffalo Lick to negotiate a peaceful settlement. A surveyor’s malfunctioning compass nearly derailed the agreement. William Bartram reported an Indian chief’s temper tantrum over what he considered a bewitched instrument. But the instrument’s measurements were disregarded, and the Creek Indians ceded much of Georgia to the colonists, not realizing this was a permanent deal because they didn’t understand the concept of private property rights. They thought they were merely giving the British temporary permission to use their territory. My quest to find this site resulted in a comical failure. According to Dr. De Vorsey, the true site of the Great Buffalo Lick is 5 miles north of Philomath in Oglethorpe County, and .5 miles south of Buffalo Creek. I drove well past Philomath without being aware I’d passed it. My daughter asked me when were we going to get to the site. I told her when we passed Philomath, and she informed me that we’d passed it a long time ago. I drove back and realized why I’d missed it–Philomath consists of just 5 houses and a volunteer fire station. I went .5 miles back in the other direction and found a hollow that looked just like one William Bartram described in his book Travels. He observed deep pits that buffalo, deer, feral cattle and horses licked into the clay soil, and some of these hollows filled with grass. I saw this and assumed it was the site and photographed it. Later, after I came home and reviewed my notes, I realized I only backtracked .5 miles instead of 5 miles. Oops. Nevertheless, my initial error led me to drive past this distance, and I didn’t see a 50 foot boulder, nor did I notice Buffalo Creek–two markers Dr. De Vorsey mentions in his article. The hollow I mistakenly thought was the site of the Great Buffalo Lick. Maybe it was a pit created by buffalo licking into the kaolin clay. However, it’s probably just a dried out old cattle tank. The owner of the land has Black Angus cows for sale. 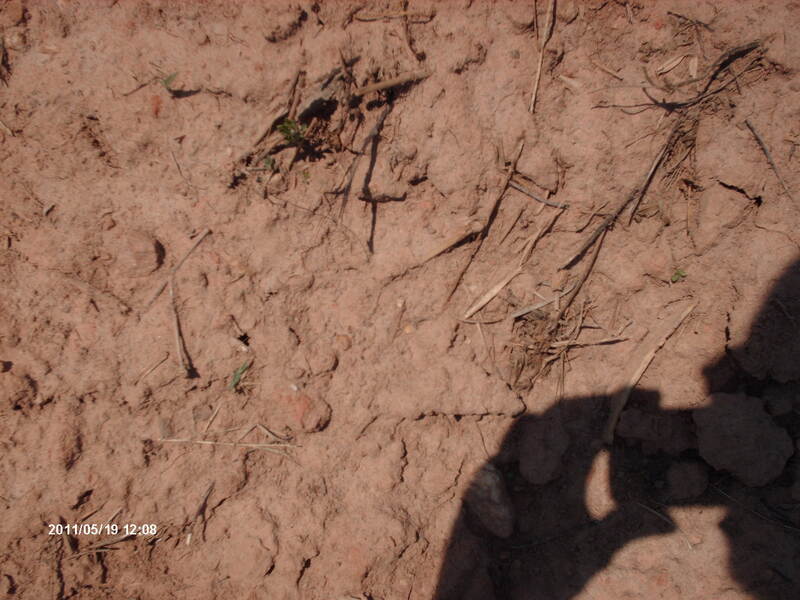 This is clay soil that may be part of the Kaolin clay vein the buffalo used to utilize. They didn’t lick it for mineral salts, but rather to aid in digestion. I’m not the first to error in locating this site. There are 3 other sites that have mistakenly claimed to have been the Buffalo Lick site. Two are in Greene County, and the other is also in Oglethorpe County. The Oglethorpe Historical Society needs to get off their duffs and put a marker in the correct location. For next week’s blog entry, I’m going to discuss how state highways mirror the ancient Indian trails. How Cold did What’s Now Georgia get during the Last Ice Age? The summertime misery of Georgia’s hot humid temperatures is almost upon residents of the state whose only refuges from the strength sapping sauna are air conditioned interiors and swimming pools. Pretty soon, we will wish for a return of the Ice Age. Comfortable summer temperatures haven’t occurred with regularity in this region for at least 11,000 years, though aberrant cool summers sporadically and rarely have. Just how cold was what’s now Georgia during the Wisconsinian Ice Age? Despite limited data, science can answer that question with some degree of certainty. The earliest studies along this line used pollen and plant macrofossils as proxies for climate. W. A. Watts (formerly of Penn State but now retired) analyzed botanical samples from granite sag ponds in Bartow County in 1970 from sediment dating to the last Ice Age. He found lots of spruce and other plants representative of northern climates and assumed a drastic lowering of average temperatures compared to those of today must have been the norm then. Dr. Stephen Jackson of the University of Wyoming also excavated this site and did find forest trees with more northerly modern ranges including jack pine and red pine as well as Critchfield’s spruce, an extinct temperate species. There’s no doubt cooler summer temperatures allowed for an influx of boreal flora as far south as north Georgia. However, Dr. Fred Rich of Georgia Southern has conducted numerous studies of plant macrofossils and pollen in Georgia’s coastal plain, and he’s found that plant communities in south Georgia consisted mostly of the same species that occur here today, albeit with a slight influx of such cool climate species as beech, spruce, hemlock, and basswood. The one study of Ice Age pollen and macrofossils in the piedmont at Nodoroc near Winder reveals a transitional mix with northern and southern species. This suggests a significant variation in temperatures between north and south Georgia during the Ice Age perhaps because proximity to the gulf stream off the Atlantic Coast meant warming oceanic winds created a “thermal enclave” here. One climatic model predicts average annual temperatures were as much as 15 degrees C (~27 degrees F) lower in Georgia during the coldest phase of the Ice Age, or Last Glacial Maximum (~28,000 BP-~14,000 BP) due to cold winds blowing off the ice sheet ~270 miles to the north of the state. But this model is contradicted by a study of actual data gleaned from noble gas concentrations in ground water. I think this data is more accurate, in my opinion, than climate models which are little more than wild guesses. Map of the Florida aquifer. 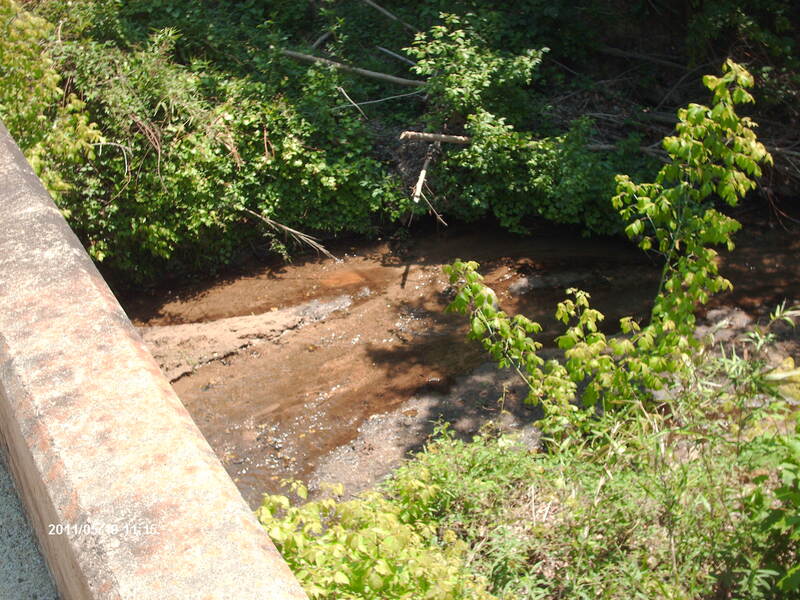 The study mentioned below took a sample of water in Georgia from this aquifer. The bottom layer of water here was originally deposited during the LGM. Scientists are able to determine past average annual temperatures by comparing the concentration of noble gases in air bubbles found in ancient groundwater with those found in today’s water. Groundwater is the well water that our pioneer ancestors used to depend upon for drinking water, and some people, living in the boondocks, still do. The top layer of groundwater is always being recharged by rainwater and seepage from the watershed above. This top layer doesn’t mix with the bottom layer of water which is much older. Scientists were able to determine the age of the bottom layer of groundwater in the Florida aquifer, which also underlies most of south Georgia. 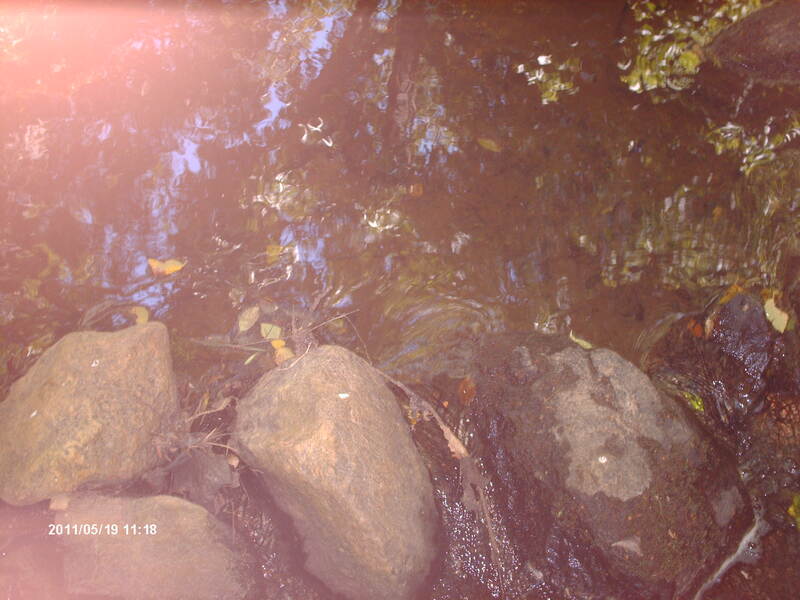 This water was originally deposited during the LGM ~20,000 years ago when the water table was very low. Since then, the water table has risen, and the recharged water stays on top. Water can only absorb so much atmospheric gas before it becomes saturated. Once saturated, it ceases to absorb more gas, so scientists know that the concentration of noble gases in the bottom layer of ground water is in the same ratio as occurred from the atmosphere during the Ice Age. Scientists look at noble gases (helium, neon, argon, etc.) because they’re inert and don’t react with other elements–chemical reactions would throw off their calculations. To get samples of ground water, they bore a hole to the bottom of the aquifer and collect samples of water with a Niskin bottle. A Niskin bottle. Scientists use this to collect water from the depths. It keeps water under a certain pressure to prevent alteration of data. Scientists then run a sample through a mass spectrometer. Chart of how a mass spectrometer works. The actual machine resembles a hospital MRI. I could find no layman’s explanation for exactly how scientists determine the temperature based on noble gas concentrations, but I got the impression from reading their research papers that it’s based on simple gas laws. If the temperature, pressure, and volume of one sample are known, and the pressure and volume of a second sample are known, the temperature of that second sample can be calculated because all 3 variables are proportional. According to a study led by J.F. Clark, who used the technique described above, average annual temperatures in south Georgia were only 4 degrees C (7 degrees F) lower during the LGM. A similar study of ground water in Maryland found average annual temperatures were 9 degrees C (~16 degrees F) lower, showing a significant north south gradient. North Georgia’s temperatures fell somewhere in between. These are average temperatures. A particularly cold year could see a drop in average temperatures even lower. I suppose a bitter winter during a stadial could see a year with average temperatures as much as 17 degrees F lower in south Georgia; and vice versa–a warm year probably had temperatures as warm as an average modern year. Another study found reduced seasonality during the Ice Age. This one of foraminifera in the Atlantic Ocean (see last week’s blog entry for an explanation of this) determined that average August temperatures in Atlantic ocean tropical waters were 23 degrees C (73 degrees F) compared to 28 degrees C (82 degrees F) today; while mean winter temperatures were 19 degrees C (66 degrees F) compared to 21 degrees C (70 degrees F) today. This suggests summers were much cooler in the southeast then, but winters were only a little cooler. Combine cooler temperatures with lower CO2 (less humidity), and it would have been quite comfortable for humans to live in the region then. During the Ice Age climate fluctuated dramatically probably leading to lots of bizarre weather events and freak storms. Warm air flowing north over the Gulf of Mexico often met cold air flowing south from the glacier that covered all of Canada. Because the atmosphere contained less moisture, many cold fronts were dry and windy, but on occasion moisture from the gulf would accumulate, causing blizzards and ice storms in winter and monster tornadoes in spring and summer. I’m sure that occasionally these tornadoes surpassed those we’ve experienced during this year’s unusually stormy spring. Giant tornadoes likely blasted forests to smithereens, leaving shredded timber to dry during prolonged droughts in the arid Ice Age climate. Eventually, a severe electical storm would break this drought and ignite all that dried out tinder, causing a massive wildfire that would convert forestland to prairie, creating habitat for mammoth, bison, horse, llama, jack rabbit, ground squirrel, upland plover, prairie chicken, bluestem grass, sunflowers, and myriads of other denizens of the open plains. A photo of an ocean drilling project from google images. 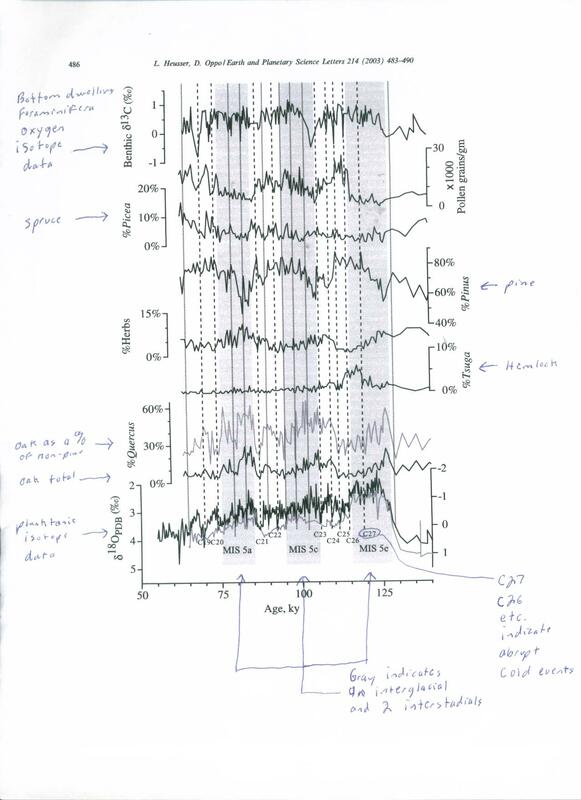 In 1997 oceanographers journeyed to a remote location over the Blake Outer Ridge, an extension of the continental shelf that consists of sedimentary drift. “Sedimentary drift” is just a fancy expression for the sloughing off of eroded land. Here, the ocean is almost two miles deep. Nevertheless, they were able to send a drill to the bottom, but it didn’t stop there–it pierced the deep sea mud for the length of a football field and brought back a plug of this carbonate ooze for analysis. They found no oil, nor gold, but they did find something of indispensible value for paleoecologists and paleoclimatologists–ancient pollen and foraminifera. Map of Blake Outer Ridge from google images. The coordinates of where Ocean Drilling Project 1059A took a core is 31 degrees north 40,46 and 75 degrees west 21,13. Two brilliant scientists from Columbia University conducted a remarkable study of this plug of ocean mud. Linda Huesser and D. Oppo took samples at 10 cm. intervals to a depth of 40 meters. They estimated these intervals to be the temporal equivalent of ~400 year intervals, so that for every 10 cm. they were turning the page of an ecological record book that stretched back 400 years a page. The study covers a period of time from ~140,000 Bp-~50,000 Bp, making this the only “chronostratigraphical” study of pollen from this time period in the southeastern region of North America. They found a correlation between oxygen isotope ratios in oceanic foraminfera, and the waxing and waning of spruce/pine and oak forest abundance. Foraminifera are single celled protozoa with shells made of calcium carbonate. Foraminifera absorb oxygen in their shells from water. This sea water contains varying amounts of heavy oxygen, or O-18, which is an isotope of normal oxygen. (An isotope is an element with a different number of neutrons than its parent element.) During cold climatic stages known as glacials and stadials, there is more heavy oxygen in the ocean because of increased evaporation due to a more arid climate as much of earth’s water becomes locked in ice. Photos from google images. Top: Cibicidoides weullerstarfi. Bottom: Globigerinoides ruber. Scientists used fossils of both of these species of foraminfera in this study to determine past temperatures. Cesar Emiliani formulated a mathmatical chart that estimated past temperatures based on ratios of heavy oxygen to normal oxygen in the shells of foraminifera. These estimates are considered accurate. He numbered past stages of climate corresponding to the oxygen isotope ratios. The stages from 75,000-140,000 years ago are known as 5a, 5b, 5c, 5d, 5e, and 6. The final stage of the Illinois Ice Age is 6; the Sangamonian Interglacial is knowns as 5e; 5c and 5a are warm interstadials within the Wisconsinian Ice Age; 5b and 5d are stadials, or cold stages within the Wisconsinian. Pollen graph from the paper referenced below. The x axis is time represented at 5,000 year intervals from 140,000-50,000 BP. The y axis is abundance of pollen from oak, pine, spruce, hemlock, and herbs. Planktonic and benthic foraminfera oxygen isotope ratios are also on the y axis. There is a correlation between oxygen isotope ratios and the abundance of certain kinds of plant pollen. Low ratios of heavy oxygen indicate warm climate. These low ratios correlate closely with high abundance of oak, and vice versa. Pollen from southeastern North America reached the Blake Outer Ridge via wind and rivers flowing into the ocean. The pollen graph above shows the correlation between tree pollen and oceanic temperatures estimated using oxygen isotope ratios in foraminfera as proxies. 140,000 years ago pine dominated the forests and spruce was a common component. The transition ~132,000 years ago from the Illinois Ice Age to the Sangamonian Interglacial was marked by a dramatic increased abundance of oak and a significant decrease in spruce. Pine remained common throughout, only falling below 50% during one interstadial, though at the beginning of the Sangamonian it fell from 70% to 55%. This data is interpeted to mean that oak forests and oak and pine savannahs prevailed during warm climatic stages, while pine/spruce dominated the landscape during cold climatic stages. In the southeast, however, spruce never became as prevalent as they did in the Appalachians and midwest. Probably, the increase of spruce in the south can be explained for a couple of reasons: 1) Cooler summers allowed for an influx of spruce from the extensive spruce forests of the north, and they took space away from oaks. Pure spruce forests may have existed in north Georgia, but in the piedmont and coastal plain it probably existed as an occasional component of mixed forests. 2) Coniferous trees compete better than oaks in arid atmospheres with lower CO2 levels like those that occurred during stadials. The graph shows that oaks increased with every interstadial, but unlike the interglacial of today, spruce and hemlock didn’t disappear completely from the coastal plain, indicating summers that were still cool enough at least for one species of spruce as well as the hemlock. In my March 23rd blog entry I reviewed some of the Natural Environments of Georgia chronicled by the late Charles Wharton. Here, I hypothesize on some Ice Age environments that likely were common during stadials and interstadials. Ice Age floral associations should be considered the norm because glacial stages including both usually last 10 times longer than full blown interglacials. Today, floral associations that we consider normal are actually an aberration. 1. Spruce, hickory, beech–W.A. Watts found a pollen fossil site in north Florida dating to late in the Wisconsinian Ice Age that seems to have been a forest co-dominated by these unlikely “disharmonious” species. He discovered this site before science knew about the extinct species, Critchfield’s spruce, which apparently was a more temperate type than its northerly cousins. I suspect spruce, hickory, beech was probably a common type of old growth forest association throughout the south, especially during interstadials. There is no evidence that any of the modern spruce species penetrated farther south than Bartow County, Georgia. 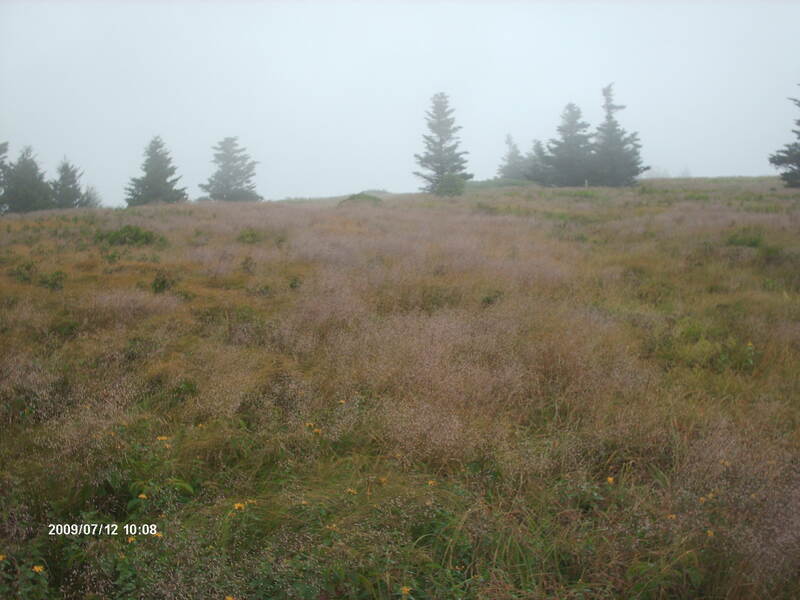 Most of the spruce pollen from the ODP 1059 study likely came from Critchfield’s spruce. 2. Grassy oak savannahs–Extremely rare today, I suspect this was a common landscape during warm dry interstadials. A pollen sample from sediment at the vertebrate fossil site, Watkins Quarry, showed evidence of an environment with lots of grass and some oak. Dry climates inhibited the growth of trees, but the decreased number of thunderstorms meant a lesser frequency of fire, perhaps allowing oaks to outcompete pines. An environment like this would have been ideal for megafauna and perhaps they maintained it through grazing, trampling, and uprooting trees. Acorns, grass, and berries provided a lot of food. 3. Open pine savannah–I already discussed this type (still common until European settlement) in an earlier blog entry. 4. Mixed forests of southern and northern pines and oaks–The piedmont was likely a transition zone between spruce forests in the mountains and pine and oak savannahs in the coastal plain. 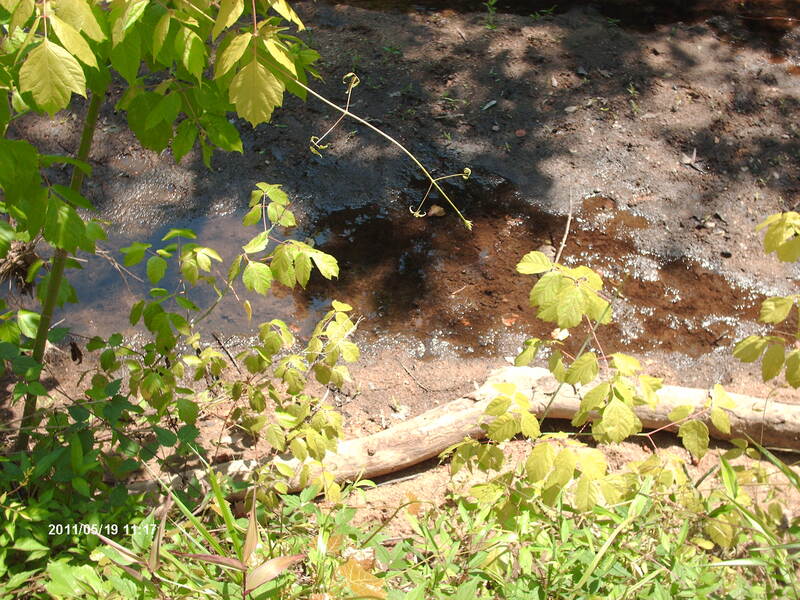 The Nodoroc mud volcano in Winder, Georgia yielded pollen from both northern and southern pines as well as oak, hickory, fir, chestnut, and beech. It was likely a region with mixed stands of white pine (a northern type) and shortleaf pine (a southern type), and oaks interspersed with meadows and bushy thickets in varying stages of forest succession depending upon when the last fire or tornado swept through. These provided a variety of patch habitats for wildlife. 5. 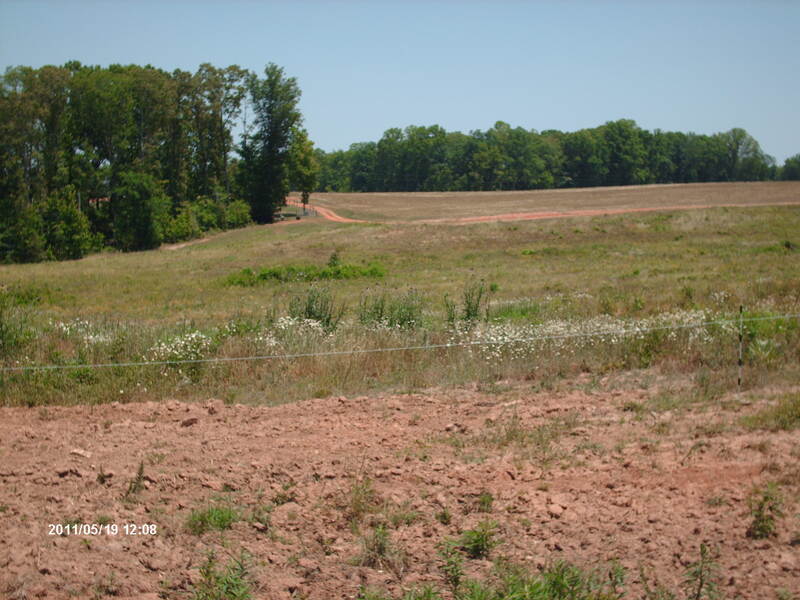 Blue Stem Black Belt Prairie–Black belt soil with blue stem grass prairie was more common in Alabama and Mississippi until European settlement but some occurred in Houston County, Georgia. The soil in some of these areas inhibits tree growth. Unchecked fires caused by frequent thunderstorms during warm wet climates, droughts during dry climatic phases, and megafauna grazing would’ve made this type of environment more widespread during the Ice Age. 6. Oak sand scrub–During cold arid stadials, rivers shrank and dried up completely in many places. Winds blew river sands across the landscape in big eolian dunes. Blackjack oaks, cedars, and grass took root on some of these, but the poor quality of the soil only allowed for scrubby growth. Oak thickets, cactus, and sparse grass were likely a favored habitat of the flat-headed peccary and hog-nosed skunk. 7. Mountain pine, spruce, and meadow–This type was probably common in the north Georgia mountains and consisted of white pine, and several kinds of spruce interspersed with large meadows. Appalachian balds may be relics of this type of environment. Photo I took of an Appalachian bald in North Carolina. This type of landscape was probably common in north Georgia during the Ice Age, and may have occurred well into the piedmont. One of my very first blog entries is all about Appalachian balds which contain disjunct populations of plant species not found anywhere else south of Canada. 8. Hemlock Forests–Cool moist climatic stages allowed for the spread of this kind of environment. The highest level of hemlock pollen occurred during the late Sangamonian Interglacial, indicating cool moist climate preceded the regrowth of glacial ice. In fact one of the findings of the below referenced study was that temperature changes precede changes in growth or dissolution of glacial ice. It sounds like everybody’s burglar alarm is blaring in Evans, Georgia. But the noise doesn’t originate from annoying, malfunctioning security systems. Instead, the 13 year periodical cicadas have emerged. For over a decade these insects have lived a foot underground, well below the frost line, but now they’re ready to mate–a frantic affair that takes place within a timespan of 3-4 weeks. Almost their entire lives, they’ve lived as nymphs, surviving on the xylem fluids of deciduous trees. The urge to mate causes them to dig tunnels to the surface which they crawl through. Sometimes they continue to crawl, making it halfway up a wall or a tree trunk before the winged adult bursts through the back of the shell of its thorax. The holes from which they’ve emerged are visible, their molted shells scattered under foot like discarded shrimp exoskeletons at a Cajun seafood boil. 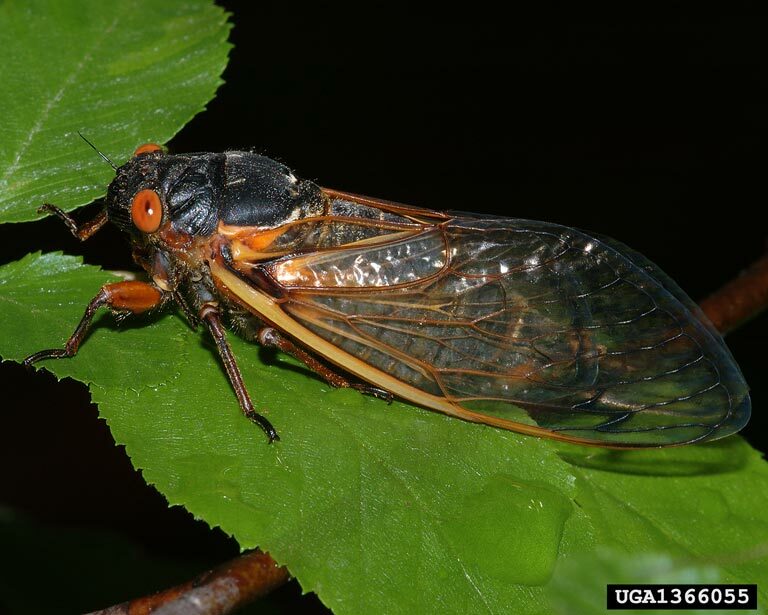 Photo from google images of a periodical cicada. The unusually long period between emergences among the 7 species of periodical cicadas in the genus Magicicada puzzles scientists who hypothesize about its evolution. Magicicada emergences in large numbers are obviously a defense mechanism known as predator satiation. Like passenger pigeons, they occur in such a high population that they overwhelm the ability of predators to consume them. Unlike other types of cicadas which are strong, fast fliers, periodical cicadas are clumsy and slow, but so many appear at once that predators are unable to consume most of them before they have a chance to mate and lay eggs. Some scientists think their emergences every 13 or 17 years (depending on the species) is a way to keep predators from increasing their own populations after exploiting them as a food source, thus avoiding a cycle when predator numbers eventually escalate enough to decimate cicada numbers. This seems an unlikely explanation to me for 2 reasons: cicadas are only available for a few weeks a year which is not enough time to have a significant long term impact on predator populations. More bird nestlings may survive at first due to the abundance of cicadas, but then for the rest of the year, they must adapt to the normal supply of food. Moreover, the average wild bird only lives 2 years–far shorter than 13 or 17 years. Cicadas could avoid upswings in predator populations with much shorter periods between emergences. Other scientists believe the odd high prime numbers emergences can be explained by a combination of predator cycle avoidance and interspecific competition among nymphs. Although several entymologists have derived statistical models supporting this theory, I think the paleoclimate explanation proposed by R.T. Cox, C.E. Carlton, and independently by Yoshimura is more plausible. Periodical cicadas depend specifically upon deciduous forests. During the coldest stages of Ice Ages, deciduous forests north of the southern Appalachians were rare relics outnumbered by other environments such as spruce forests and prairies. The bulk of deciduous forests then occurred south of the Appalachian mountains. Even here, summer temperatures occasionally were too cold for cicadas in the Magicicada family. They require temperatures above 68 degrees F for a period of 3-4 weeks for flight and mating. Drs. Cox and Carlton assumed that during the coldest stadials (which lasted on average 1500 years) 1 in 50 summers failed to reach this temperature, and cicada reproduction failed. Using a statistical formula, they estimated that over a 1500 year stadial, cicadas emerging every 6 years had a 4% chance of avoiding unusually cool summers; cicadas emerging every 11 years had a 51% chance of avoiding unusually cool summers; but cicadas emerging every 17 years had a 96% chance of avoiding unusually cool summers. Cicadas emerging after shorter periods were eventually eliminated from the gene pool, while those with genes for longer cycles became dominant. Map of Magicicada ranges from the below referenced paper. The distribution of 13 and 17 year periodical cicadas supports the paleoclimatic explanation for their high prime number emergences. 17 year cicada species tend to live north of 13 year cicada species, even though the shorter cycle is a dominant gene. Summers too cool for breeding would’ve occurred more frequently in the norther parts of their range, so those with 17 year cycles would’ve had a greater chance of avoiding them than those with the 13 year cycle. –Periodical cicadas are slow. I was able to catch one by simply picking it off the ground after if fell in flight and landed on its back. –Birds are feasting on them. Crows are catching the nymphs as soon as they crawl to the top of their tunnels. I also saw a Canadian goose nab one that fell in a small lake. –They must be mole food during their nymph stage. –Evans has become heavily developed. Cicada habitat has been greatly reduced and covered with blacktop parking lots from which they can never emerge and escape. I wonder if this is another creature that survived for millions of years, until the actions of Homo sapiens eventually renders them extinct. You are currently browsing the GeorgiaBeforePeople blog archives for May, 2011.